The summer of 2011 will be remembered as the year of the Dollar Lake Fire in the Mount Hood area, as much of the north side is still smoldering from a lightning-caused wildfire that ignited on August 26. Though a calamity to those who loved the verdant forests on Mount Hood’s northern slopes, the fire is a blip on the screen when compared to the many explosive events that have rearranged the mountain’s forests and topography over the millennia. Among the most recent and fascinating of these events are the Old Maid eruptions. These explosions knocked over entire forests on the mountain’s south side like matchsticks, burying them under a deep layer of ash and volcanic debris. This article describes the Old Maid events, and how to see traces of their aftermath today. While most tourists at Timberline Lodge on a given day are blissfully unaware that Mount Hood is living volcano, the occasional, heady odor of sulfur fumes blowing down from the crater are a reminder the “quiet” spell we are enjoying is only temporary. In geologic terms, the Old Maid eruptions are incredibly recent, finally winding down in our recorded history of the early 1800s. 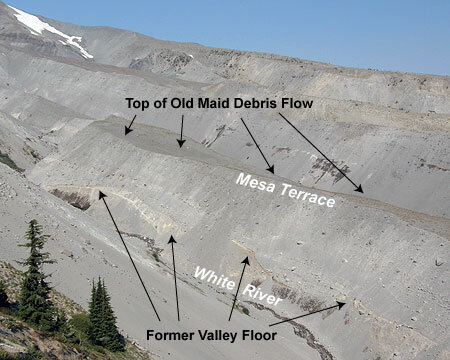 The events are named for Old Maid Flats, the debris plain created by the eruptions in the Sandy River canyon, though the impact on the mountain was much broader. Scientists have determined the Old Maid eruptive period to have occurred within from about 1760 to 1810 A.D. In fact, when Lewis & Clark described the shallow “quicksand” delta of the Sandy River in 1804-05, they were looking at volcanic sediments that had only recently flooded down the river from the active slopes Mount Hood. The former floor of the White River canyon is visible as a thin layer of oxidized soil, dotted with mummified trees. The scientific accuracy of these dates is made possible by thousands of mummified trees swept over by the Old Maid debris flows, and later exposed by streams cutting into the sediments. The White River buried forest is one of the more prominent locations where these flattened forests and the former valley floor can plainly be seen. The Old Maid eruptions originated in the modern crater of Mount Hood, where sulfur fumes still rise from the vents known as the Devils Kitchen. The massive, 800-foot volcanic dome of Crater Rock, itself, is just 200 years old and formed during these eruptions. The heat of rising magma in the crater eventually sent pyroclastic flows down the Sandy and White River canyons — rolling clouds of super-heated ash and debris that buried the entire landscape. 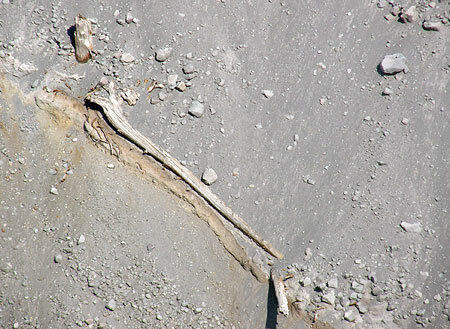 A closer look at the buried valley floor reveals mummified trees. The Old Maid eruptions deposited about one hundred feet of debris throughout the upper White River canyon, filling the formerly U-shaped glacial valley with a flat fan of volcanic boulders, cobbles and fine ash. 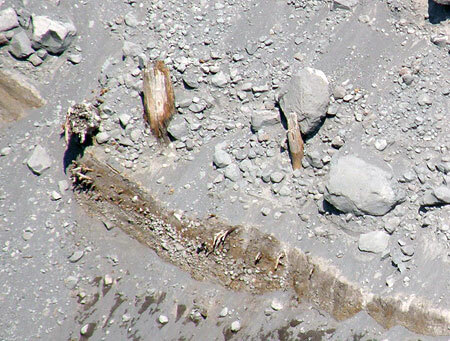 The outflow from the White River Glacier has since carved deeply into the debris flow, revealing the old valley floor and some of the thousands of mummified trees knocked over by the Old Maid event. 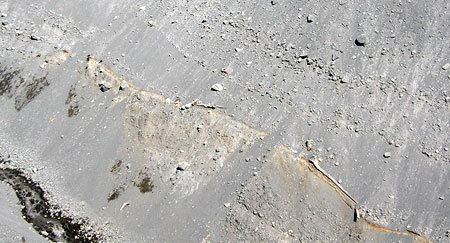 A flat-topped ridge in the middle of the White River canyon known as Mesa Terrace (see earlier schematic) is a remnant of the debris flow that shows the original depth of the debris above the valley floor. Close-up of an entire tree, tipped over and buried where it fell on the former valley floor. Two types of debris flow swept down the southern slopes of Mount Hood during the Old Maid eruptions. The most destructive were the pyroclastic flows, which many of us are familiar with from the colossal Mount St. Helens eruption of May 18, 1980. 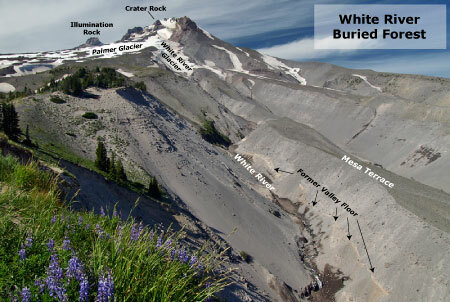 In addition to the hot pyroclastic flows, cooler mudflows from flash-melted glaciers and snowfields also swept down Mount Hood’s south slopes during the Old Maid events. 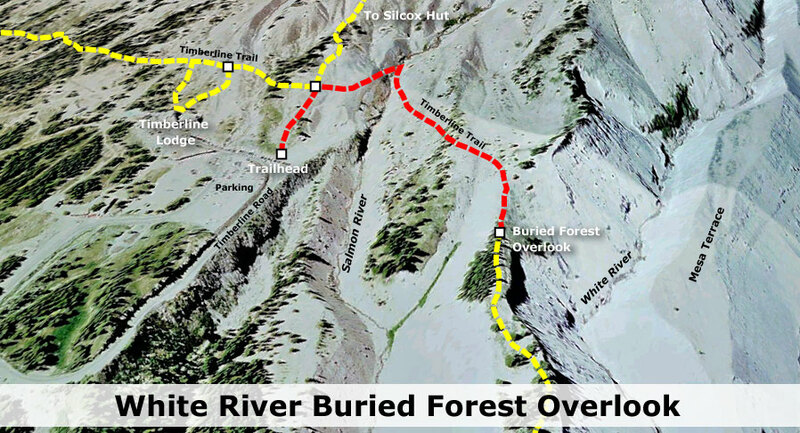 We know the buried forests at the bottom of White River Canyon fell victim to these mudflows, as pyroclastic flows would have instantly incinerated the standing timber. Instead, the cooler debris flows simply knocked the forests over, and buried them under layers of mud and debris. Scientists believe these trees were partially buried, then broken off by subsequent flows. Scientists believe the old valley floor now being revealed by erosion was of glacial origin, dating back to the last major glacial advance of the White River Glacier some 10,000 years ago. Thus, forests grew undisturbed along the former valley floor of the White River for a very long time. 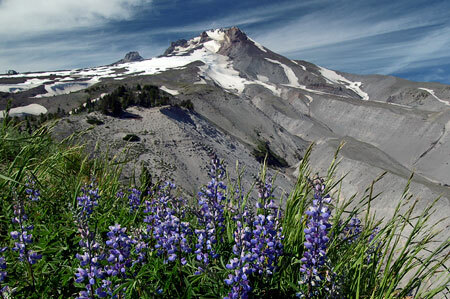 Hiking to the White River buried forest overlook is easy and scenic, as well as historic and iconic: it follows Mount Hood’s famous Timberline Trail for 0.7 miles to the impressive rim of the White River canyon. This section of trail also serves as the Pacific Crest Trail, the 2,000-mile epic trek from Mexico to Canada. To find the trailhead, park in the lower, overflow lot located to the east of Timberline Lodge. Park near a gated dirt on the west side of the parking area. Follow this old road steeply uphill for about 200 yards to an obvious junction with the Timberline Trail, and turn right (or, if you’re coming from the lodge, follow any of the trails beyond the lodge uphill to the Timberline Trail and turn right). The Timberline Trail quickly traverses into a side-canyon, crossing the headwaters of the Salmon River. 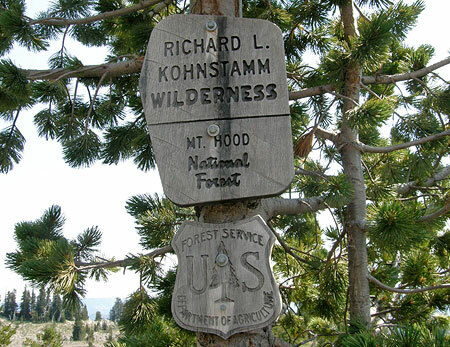 Next, the Timberline Trail rambles across pumice-covered slopes and soon reaches a sign marking the Richard L. Kohnstamm Wilderness, created in 2009 as an addition to the wilderness complex that encircles Mount Hood. Kohnstamm was the resort operator responsible for resurrecting a struggling Timberline Lodge in the 1950s, and setting the resort on the successful path that it continues to enjoy today. Beyond the wilderness boundary, the trail descends across another pumice slope, then drops more steeply on a surface of loose glacial till as it traces the west moraine of the White River canyon. Soon, you will reach the overlook where the Timberline Trail follows the moraine crest, and arrives at a stand of trees. This is a good spot to stop and take in the scenery, and especially to pick out the signs of the buried forest, at the bottom of the canyon, below. The south-facing slopes and open terrain can make this a hot, dusty hike in late summer, so be sure to carry water. You will also want a pair of binoculars to view the buried forest details more closely. 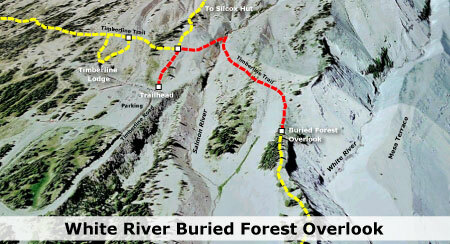 If you have the time and energy after visiting the buried forest overlook, you can retrace your step to the dirt access road, then turn right and follow it to Silcox Hut, about 0.8 miles from the trailhead. The hut was the original upper terminal for the first Magic Mile ski lift in the late 1930s, and today is maintained as an historic structure.